Thought it might be a good idea to have a thread about odd ball distros. We all know that for some strange reason penguin developers have a manga or anime itch so this first post is for them. After gaining some traction among fans of the manga and anime communities, Mangaka fell dormant in December 2009. However, developer Animesoft International regrouped and issued a new release June 6. The latest Release Candidate version came out on June 20. The Mangaka Project -- the name means "love" in Japanese -- started out with the code name of "AngelOS." The unusual desktop environment and design may not tickle everyone's fancy, but the stunning artwork built into the background images and some of the homegrown applications will give some users something to smile about. Manga, a style of printed comics created in Japan, has a long and complex history in Japanese art. Anime is an artistic literary form associated with Japanese animated productions, featuring hand-drawn or computer-generated images. Putting those two art-form cousins into one Linux distro results in one pretty slick Linux experience. More weird and wonder fulls coming soon. "I did and I'm really happy"
Tanglu GNU/Linux is a distribution based on Debian Testing. When I wrote recently aboutthe future of Linux Mint Debian Edition and other distributions based on Debian Testing, what I was concerned about was the fact that they will be changing their base to Debian Stable in the near future. Tanglu has not given any indication that they intend to change, so this could be a good alternative for the future. Their new release is available from the Tanglu downloads page in three versions, built with either the KDE Plasma or Gnome 3 desktop or a Core distribution with no GUI. Oh, and it also mentions that there is a Docker image of Tanglu available. The GUI versions are about 1.3GB each, while the Core distribution is only about 550MB. All three are hybrid-ISO images which can be copied (dd) directly to a USB stick to create bootable Live USB media, or of course can be burned to DVD (or CD for the Core version). Tanglu is a modern GNU/Linux distribution based on Debian, designed for the desktops of today, developed in the open on a modern development platform. While Tanglu is based on Debian, we explore new ways of building a distribution, giving developers and users the best experience possible. The Tanglu project is vendor-independent and has a social policy similar to Debian. Seems odd that the web page for a distro focused on art and beauty to be so plain. Tweak it 'til it breaks, then learn how to fix it. Reglue, in a nutshell, gives free Linux computers to under privileged children and their families. Well they do have a cute avatar icon on the home page and the Welcome page does say welcome. I quite like this "Codename: ANGEL-OS (Anime Native Gnu Empowered Linux Operating System). "Looks as though they are a bunch of FanSub anime tinkerers who are resurrecting an abandoned os.Out of the six team members they only have one programmer though they do very nicely give credit to all their worldwide contributors. The first link is the download page and the second is the HELP page. The information given is a tad quirky but most of it seems helpful. At a guess I would say that they are young inexperienced penguistas who just need a bit more experience. I wish them well as they come across as nice folk. Neat find Josh I like that Tanglu has a Docker image of Tanglu available. Am I right in thinking that if you have docker installed on your pc you can download the Tanglu image and run it from within a docker container rather like a VM install except much easier ? Edited by abarbarian, 22 July 2015 - 10:51 AM. This is a very strange os. I tried the live version and it worked pretty well but as it had no persistence I decided to try a full install. I have a spare drive with a borked W7, that is a W7 that was borked by MS, thanks guys.I can not be bothered with the two day W7 install experience at the moment so am going to try out some odd linux distros for fun. Initially I tried to install 4M on my pc with two ssd's, I have Arch on one ssd and I did have W7 on the other ssd. On running 4M live my Arch showed as sda and the missing W7 ssd showed as sdb. Now the 4M installer would only show up sda an as I did not want to mess up Arch I disconnected this drive and tried again. This time the W7 ssd showed as sda and I followed the simple instructions for a install happened very quickly and I was asked to reboot.On the restart 4M started to install itself which took no time at all.I'm guessing that the install script loads a script or file to the ssd/hdd and on reboot the actual install takes place. No matter what everything happened so quickly that I did not even have time to make a cup of tea. My monitor is a 1920x1200 and the 4Mfills my screen apart from a couple of inches at the bottom of the monitor.I could find no way to alter the screen size of 4M. I have downloaded and installed the Nvidia drivers and will report back after a reboot to let you know if i can alter the scree size. I also downloaded Quake1 and had a play. I could not get the Quake window to enlarge at all so I ended up playing in a postcard sized window.Apart from that Quake1 played very well indeed. All of the downloads Quake,Nvidia and FF were very quick and installed with just a couple or one click so there may not be many extra programs for 4M but what there is downloads and installs easily. Overall 4M has to be one of the fastest reacting os's I have tried.The live version worked well enough for evaluation and the ssd/hdd install procedure was a breeze. Like I said at the beginning this is a very strange os. Why not have a play ? Above are some good links and below a screenshot from my pc which does not show the empty screen space on my monitor. Booted into Arch to find out some information.Booted into 4M and it hung before installing, I think it says something about not finding a "init". So much for 4M repairing itself.Oh well it was good while it lasted though I could have done with more Quake. Edited by abarbarian, 15 July 2015 - 10:57 AM. Slax is a modern, portable, small and fast Linux operating system with a modular approach and outstanding design. Despite its small size, Slax provides a wide collection of pre-installed software for daily use, including a well organized graphical user interface and useful recovery tools for system administrators. The modular approach gives you the ability to include any other software in Slax easily. If you're missing your favourite text editor, networking tool or game, simply download a module with the software and copy it to Slax. There is no need to install and no need to configure, it simply works. Hmm I might disagree with the last comment above. Here is an old Slax review.It is here because Slax went out of development for a while and has just been reborn by its developer.The article says that Slax is 24th in the listings at Distro Watch in todays listings it is flagged as dormant. Slax is meant to be run from a usb stick.I decided to try it out and as all you need is a properly formatted stick and a working pc.I used a 8GB stick and made 2GB a swap as I only have 4 GB of ram in my pc and I also wanted to try out Slax on several othere pc's with less ram.To install all you need to do is copy and paste the slax folder from your download to the root of the usb stick.Then you have to go to the boot folder and double click a .sh or .exe file and you are fit to go. This did not go as planned when I tried from my Arch pc.I followed the instructions and could not get the usb to boot.So I tried from a Slax live cd and could not get the usb to boot.Eventually I read the boot failure message and followed a bread crumb trail of promising fixes found on the net and still the usb would not boot. # if no installed extlinux is not found at all. So I had Slax booted.Everything seemed to work ok for a while and for several reboots. However FF would load and work fine but eventually FF would flash up a window that disappeared quickly when I tried to start FF. I found a newer FF in the modules part of the Slax site and activated it after deactivating the installed FF and this worked for a few goes and the acted like its predecessor.So I tired reinstalling the old FF and same result. I gave up and tried again the next day and FF worked ok and has done since I have no idea what was wrong or how it was fixed. So I had a working Slax with persistence working. I plugged in my tv as a second monitor and it was found and worked well apart from the sound.You Tube worked with sound in fact sound worked on the pc for all programs.All the programs I tried worked well and I had some fun playing with KDE though I did find negotiating through the system settings menues a bit fiddly. I have tried the Salx stick out on four different pc's and it worked well with all of them. I also made a 32 bit version for a friends Acer Aspire One which when I figured out how to gain a boot menu worked extremly well.In addition I also have a small pocket usb 8GB hdd and the 64 bit Slax worked well on this also. Would I recomend Slax as a portable ? Well maybe, it works well but a lot of the programs are old.Take for instance FF the one on the modules site is newer than the one on the install but is still out of date as it has a 2014 date. However the developer has only just breathed life into Slax again so updates may be forth coming and if the community dalies around then all should be well. So with this in mind yes I would recomend Slax as a very likely portable keeper. Interestingly Porteus is a offshoot of Slax and I was initially impressed with it until it started to act strangley and after I struggled with it I gave up. I hope Slax lasts longer, what worries me is that they both use KDE a slice of the linux world I have always suffered glitches with. If updates for programs are slow to arrive you can always convert and use Slackware packages and I belive you can import from a few different os's.Now a friendly resident Slacker might come in very useful for such undertakings.Anyone know a suitable candidate ? Two more good articles on Slax. Edited by abarbarian, 24 July 2015 - 06:27 AM. Very nice review of Slax!! I had previously used it years ago but I did not realize that it is being actively developed again. I have a 32gb flash drive perfect for this. Ta fer the praise. I could have done more but am busy at the moment. Thought I would make the effort as am pretty impressed that Slax worked on all the pc's I tried. They were a 754, AM2, AM3, an a net book so quite a varied sample. Also the screen resolution was found correctly and a internet connection via wires was set up by the install and wi-fi only needed a password. So impressive indeed. Awesome!! Of course the kernel has gotten very good at implementing modules for most all hardware. It has gotten larger because of that but at least we do not have to recompile the kernel anymore to get drivers. Bluestar Linux is an Arch Linux-based distribution, built with an understanding that people want and need a solid Operating System that provides a breadth of functionality and ease of use without sacrificing aesthetics. Bluestar is offered in three edtions - desktop, deskpro and developer - each tailored to address the needs of a variety of Linux users. Bluestar can be installed permanently as a robust and fully configurable operating system on a laptop or desktop system, or it can be run effectively as a live installer and supports the addition of persistent storage for those who choose not to perform a permanent installation. A Bluestar Linux software respository is also maintained in order to provide additional tools and applications when needed or requested. Looks to be a well developed and updated distro. Information at the site is clear and concise which is always a good sign. Downloaded the .iso and will have a play when I get the time. RebeccaBlackOS is a Debian Testing-based live distribution that offers a developmental view of Wayland-based Linux desktop sessions. 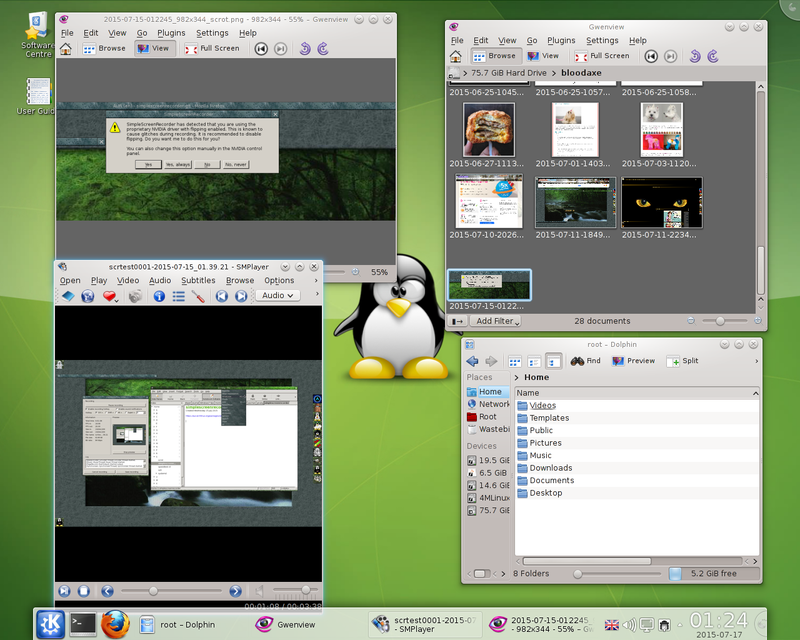 A few other distro makers such as Fedora have prototypes of Wayland running, but the options for different desktop environments available all from one live-session DVD caught my attention. Anyone curious about where Wayland development and Linux distros in general are headed can get a first look from the fan-based RBOS distro. You cannot use this beta release as a replacement for a well-stocked Linux workhorse for all of your computing tasks. Some of the desktop modules work well, however. The release is more of a proof of concept by developers working with the new Wayland display server software that may eventually replace the aging X Window System you know as "X.Org." The RBOS release is available in 32-bit and 64-bit builds for the x86 architecture. It features the Weston desktop shell, Enlightenment Desktop, Gnome 3, Hawaii Desktop, KDE Desktop, Orment, Sway and the Papyros Desktop on Wayland. I tested the current ISO booting the OS from the DVD and installing it to virtual machines. The amount of functionality and success in loading the ISO varied with the hardware. Earlier versions of RBOS did not run in a VM environment. 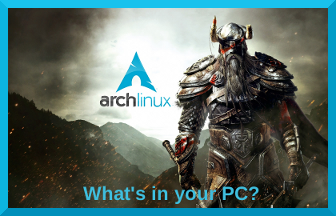 RebeccaBlackOS offers an interesting window into where the Linux desktop might be headed. The developers behind the scenes working on Wayland seem to be making far better progress than the developers working on the Wayland fork Mir. Ubuntu designers have not yet been able to get Mir working with any desktop environment. The last few Ubuntu releases have bypassed the planned Mir debute. Now my move is over I should have time to try this distro out. Good news that you can try it out in VM's. BTW if you install Gnome on Archlinux, your already running Wayland..
GNOME (pronounced gah-nohm or nohm) is a desktop environment that aims to be simple and easy to use. It is designed by The GNOME Project and is composed entirely of free and open-source software. GNOME is a part of the GNU Project. The default display is Wayland instead of Xorg. This one was Deli Linux at one point in time. I got Deli Linux to run on a Pentium 133 machine with 96MB of RAM and no CD-ROM. Even had a GUI. Brutal though. Ah ha righty ho. Wayland caught my eye a while a go and I did post here but it was quite a while ago. Life took me sideways so I lost track of the developments. Looks very interesting and hopefully now I have decent broadband and a more settled life I can get around to playing with it. Mind you I still have to install Arch on me main pc. Mind you I still have to install Arch on me main pc. Refracta is a somewhat obscure Linux distribution that offers exceptional functionality and stability. Obscurity is not always a bad thing when it comes to Linux distros. You can find some very worthwhile alternatives to your current operating system. Refracta is a big surprise in a small package. The Refracta project includes a collection of useful tools not usually found in Linux distros, such as refractainstaller, refractasnapshot and refracta2usb. They make it much easier to customize the installation or to create a custom live CD or live USB image. These tools will work on most Debian or Devuan-based systems. This distro's support is limited to i386 and x86_64 Architecture. If your computer is 32-bit, you will not be able to sample the live CD version, let alone install it. Refracta is a no-nonsense Linux distro that delivers speed and reliability. It is still a bit of a rarity, in that not too many distros have jumped on the DevuRefracta is a no-nonsense Linux distro that delivers speed and reliability. It is still a bit of a rarity, in that not too many distros have jumped on the Devuan instead of Debian fork wagon.an instead of Debian fork wagon. Leading on from the Refracta article above, really it should be the other way around as Refracta is based on Devuan, here is some information on that base os. Devuan GNU+Linux is a fork of Debian without systemd. The latest 1.0 release candidate series marks an important milestone towards the sustainability and the continuation of Devuan as a universal base distribution. Since the Exodus declaration in 2014, infrastructure has been put in place to support Devuan’s mission to offer users control over their system. Devuan Jessie provides continuity as a safe upgrade path from Debian 7 (Wheezy) and a flawless switch from Debian 8 (Jessie) that ensures the right to Init Freedom and avoids entanglement. Above seems to cover everything about this os so if you want more info then there is plenty to read on the main site. Apart from the Refract fork which has those handy transferable tools for refractainstaller, refractasnapshot and refracta2usb, there are some other interesting forks. Minimal and base LXDE, Openbox, and Xfce operating systems. Good Life Linux was made so that users with older hardware could install a minimal and base LXDE, Openbox, or Xfce system in order to make their system into what they need without any additional bloat to remove. Featuring the artwork of Ghost Sixtyseven, you get an attractive, stable, and base system (that's low on resources) which allows you to add only what you want or need. What goes on your system is up to you. There are no major applications preinstalled; such as, Firefox, Chromium, LibreOffice, Abiword, VLC, etc. No major applications are forced on you. They can easily be installed with the Synaptic Package Manager or the terminal. Aside from including some preinstalled wireless firmware, all that you get are a few essential tools and a few applications that are required by LXDE or Xfce. Other than that, you're free to install what you want on your system. heads is a GNU/Linux liveCD distribution aimed at people who like the aspect of controlling their privacy and anonymity on the Internet. You might have heard of Tails as a similar GNU/Linux distribution. heads was born as an answer to Tails, since Tails is using systemd as an init system and also contains non-free software. In heads, the init of choice is not systemd. systemd is a huge piece of software that, while being free software, has not been audited for security since its creation. Being big as it is, it is hard to do so, and as time goes, it's becoming even tougher to audit systemd. We do not aim to disrespect or get into the controversy on why systemd is a bad choice. We just do not wish to use it. Exe GNU/Linux (originating from Exmouth, in south-west England) is a "Live Linux image" preconfigured with a selection of applications for general desktop use. The image, written to CD or USB, may be used to start almost any computer with an Intel or AMD processor and runs as a complete operating system..
A fixed disk installation can be done from the "live" session. This can replace Microsoft Windows (or other OS) or install as a dual-boot configuration. The core system is a Devuan GNU/Linux base. Previous versions were based on Debian. Trinity Desktop Environment (TDE) is preinstalled. Please note, this is not an "official" Devuan nor TDE project. There are other forks but these particularly caught my eye. The GoodLife as it is suited for older hardware plus it is a very minimal base to build your own custom os, reminds me a tad of the Arch way. Tails because it is a systemd free security os and Exe due to its Trinity environment plus it is developed in the UK. Now this is one strange offering, be sure to have a look at the videos linked to at the top of the page. TempleOS is a free, public domain, open source, x86_64, non-preemptive multi-tasking, multi-cored, ring-0-only, single-address-map (identity-mapped), The CIA obsfucates to foil India, China, Russia and Korea. They make things more complicated than necessary. TempleOS is more simple than necessary. It is "Hello World" joke, you can see why I [/url]capped the line count of TempleOS at 100,000. I, Terry Davis, wrote all 80,849 lines of TempleOS over the last 14.0 years, <a name="l17">including the 64-bit compiler. I have been a professional operating system developer since 1990 when I worked on Ticketmaster's VAX OS. Seems the developer is a pretty smart guy but unfortunately is possibly not on the same wavelength as most folk. Quite sad really. These are two very interesting articles on Temple OS. Edited by abarbarian, 19 September 2017 - 08:20 AM. Terry Davis, a schizophrenic programmer, has spent 10 years building an operating system to talk to God. Also, TempleOS does not use the linux kernel so why even mention it here? Development for TempleOS began in 2003 after Davis suffered from a series of manic episodes that left him briefly hospitalized for mental health issues.Davis is a former atheist who proclaims that he has had "communications" with God, and that God told him the operating system he built was for God's third temple. According to Davis, TempleOS is of 'Divine' intellect due to the inspired nature of the code. According to Davis, God said to create the operating system with 640x480, 16 colors display and a single audio voice. The operating system was written in a programming language developed by Davis in C and C++, called "HolyC"
Back in the summer, we asked ourselves one simple question: if we like PIXEL so much, why ask people to buy Raspberry Pi hardware in order to run it? There is a massive installed base of PC and Mac hardware out there, which can run x86 Debian just fine. Could we do something for the owners of those machines? You’ll find all the applications you’re used to, with the exception of Minecraft and Wolfram Mathematica (we don’t have a licence to put those on any machine that’s not a Raspberry Pi). Because we’re using the venerable i386 architecture variant it should run even on vintage machines like my ThinkPad X40, provided they have at least 512MB of RAM. I'll be giving this a whirl when I get my backup pc running again. Yer right it ain't linux but I could not think where else to put it. I included it as it is a very odd os and this is a thread about odd os's. First USA Linux hardware manufacturing plant opens !